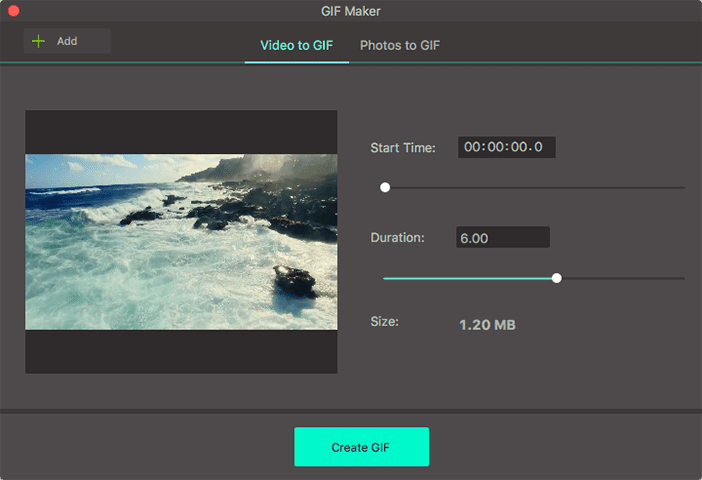 Tired of the long length of a video and you just want to make an interesting short GIF in order to share on your social media accounts with friends? iSkysoft Video Converter Ultimate provides you with 2 easy ways to make a GIF file using your selected photos or clip cut from videos! After launching the software, click "Toolbox" tab > "GIF Maker" option. In the poping-up window, you could see 2 options: Video to GIF and Photos to GIF. Select the mode according to your requirement, and then click "Add Files" button to load original video or photo files. Video to GIF: Once you imported your original video, you could see a view window on the left. Select the desired video clip by dragging the arrow icon. Alternatively, specify the starting time and ending time on the right, from where you could also set the output size, frame rate and output folder. When everything is OK, hit "Create GIF" button and wait for seconds to get your GIF file! Photos to GIF: First import your photos by "Add Files" button. When the photos are displayed on the right, you could adjust the order for display by dragging certain photo to the ideal place, and you are also allowed to set the output size, frame rate and output destination. Use the pre-view box to check the output performance, and hit "Create GIF" button when you consider OK.